Journalism school and 26 years working as a reporter and editor have prepared me for almost anything likely to come through the newsroom, but it still galls me that people are more likely to cancel their subscriptions over the disappearance of a pantsless cartoon character than anything I have actual control over. And it illustrates a difficulty in answering the question of what the audience is for local news. By “audience,” I mean the portion of the public who cares enough about local news that they would be willing to pay to support the reporting of it. The audience is not the paying base of print newspaper subscribers – certainly not the larger base of 15 years ago, and not even the shrunken one we have now. It is a subset of that – perhaps a small one. For decades, newspapers added on sections and specific features so that no matter what your interest, there probably was something in that package of disparate material that would interest you. They did this not because there was any inherent relationship in the material or it seemed logical to package it but because it was the surest way to build the readership. Perversely, adding readership could even cost the newspapers more than what they charged for a home subscription, but the bigger the readership, the higher the rates that could be charged to advertisers, which is where the big money was anyway. And that’s exactly why the industry’s reaction to declining advertising has fueled circulation declines. Drastic declines in advertising revenue over the past decade led to a focus on newspapers’ “core mission,” which obviously is local news. That’s what we do that you can’t find anywhere else. That meant cutting some features that newspapers paid to get, but it also meant cutting some staff – movie reviewers, NASCAR reporters, reporters covering college sports in a distant town, food writers, science writers – especially if what they covered was also provided by the wire services the newspapers already paid for. But that increasingly left a product that is not exactly what we originally sold our readers, and I see that all the time in my job as editor of a small local newspaper. I don’t get that many complaints about local news. But I get a lot of complaints from sports fans that we don’t have enough college and pro sports results in the paper. We need more agate and box scores. I get quite a few complaints that our main news section is actually too local, with not enough national and international news in it. I get heated complaints when the person in charge of placing the Cryptoquote puzzle in the paper screws up and leaves it out or runs the same puzzle two days in a row. But by far the greatest number of complaints during my first year in Lenoir came as a result of two business decisions: to drop our Saturday edition, and to change our comics lineup. And almost none of the complaints had to do with missing a day of news. The Saturday edition was dropped because it had easily the lowest single-copy sales of the week and was the edition with the least advertising – virtually no advertising, in fact. The complaints: delayed sports results (Friday night results run Sunday), a day without a chuckle from the comics, and the possibility that an obituary might be pushed to Sunday when services were Saturday. But predictably, the worst reaction was to the comics, which changed as part of a renegotiation with syndicates and a level of standardization to help the staff in our pagination and editing hub more easily handle all of the comics pages they are responsible for. One unintended result of the change was that the size of the crossword shrank, which prompted several people to tell me that the “only reason” they subscribed was for the crossword, which now was too small to be used. After a week, we were able to move the puzzle and fix that. But the dropped comics – which included “Ziggy,” “Peanuts,” “The Lockhorns,” “Family Circus” and “Belvedere” – have cost us quite a few subscribers. You might note that all of the dropped ones are quite old, and some (“Peanuts,” “For Better or Worse” and “Belvedere,” for instance) have been in reruns for years. Others are on their second or third generation of artists. But people hate change. Tell a fan of “Belvedere” that no new comic had been drawn since 1995 and the response is that the fan doesn’t remember that far back, so all of them seemed new to him. 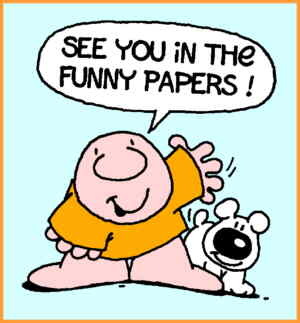 “The paper is mainly full of bad news, and Ziggy always made me smile,” one reader complained. And there’s that age-old complaint: All the news is bad. You never print any good news. Neither is true, but a great many people just don’t want to be bummed out. Those are the people who bought the newspaper because of all of the things besides local news that came in the package. They tossed aside all the stuff they didn’t want and turned to their 50-year-old comic strip or their word puzzle, or their sports. But the stuff they didn’t want is what I think any reasonable person would say is the “core mission” of the local newspaper. Everything else they can find somewhere else – and have been finding it, as their local newspaper has dropped feature after feature. Perhaps that’s why the Orange County Register’s circulation has remained flat even as new owner Aaron Kushner has brought back a hefty number of features – while also beefing up the staff that pursues the “core mission” of local news. I have had a number of longtime readers call or mail in to tell me how much they like the newspaper since I got here, that it feels like a “real” newspaper or that the local stories are more interesting. The publisher tells me that neither here nor anywhere else she has worked has she seen so many compliments for the news. So I know local news has an audience. But I don’t think anyone has a clue how big or small that audience might be, and circulations continue to drop.